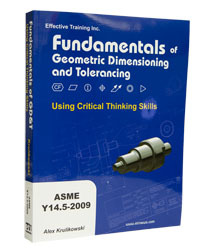 The Fundamentals of Geometric Dimensioning and Tolerancing Using Critical Thinking Skills textbook has been completely updated to reflect the changes in the ASME Y14.5-2009 Standard. This third edition preserves the best features of the first two editions while adding new material that reflects the changes in the field of geometric tolerancing. The book includes several new features that aid in the understanding of geometric tolerancing. It also focuses on critical thinking skills that help the reader with the application of newly learned GD&T concepts on the job. It’s the most practical and easy-to-use GD&T text on the market. Each of the textbook’s 27 chapter focuses on a major topics that must be mastered to be fluent in the fundamentals of geometric tolerancing. Each goal is defined and supported by a set of performance objectives. There are more than 260 performance objectives that describe specific, observable, measurable actions that the student must accomplish to demonstrate mastery of each goal and are a key to success for both the student and the instructor. Material that builds and develops critical thinking skills is contained within each topic, with questions that utilize those skills at the end of each chapter. Skill level needed: A basic understanding of engineering drawings is required. Format: The Fundamentals of Geometric Dimensioning and Tolerancing textbook has been completely updated to reflect the changes in the ASME Y14.5-2009 Standard. The goals and performance objectives of each chapter are clearly described to keep you focused on the material. At the end of each chapter, you will find a number of exercises to reinforce the material once you have learned it. The Fundamentals of GD&T Using Critical Thinking Skills (ASME Y14.5-2009) is only available to the general public. It is not sold to educational institutions.